For professional rug cleaning collectors, dealers, designers, commercial establishments and homeowners entrust Dilmaghani with their precious carpets and rugs. 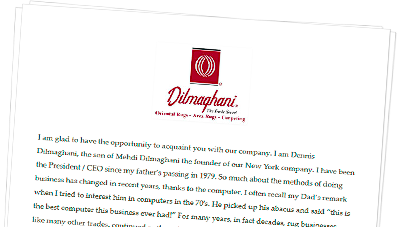 For Dilmaghani’s Cleaning & Repair, please fill in this form or call 914-472-1700. Please note, we CANNOT accept rugs for cleaning/repair from walk-in customers at our Scarsdale or Brewster locations. For Cleaning Pick-Up & Delivery, call 800-232-3462. Fine rugs must be cleaned in a professional rug cleaning plant where they can be carefully washed, rinsed and dried. On-location cleaning is suitable only for permanently installed broadloom carpeting, never for Oriental Rugs! Important Advice – Never allow anyone to clean your Oriental Rug or Area Rugs in your home! After the wash, your rug dries in a climate – controlled room where temperature and humidity are carefully monitored for optimum drying conditions. This professional drying process is one of the most critical steps in rug conservation and an essential reason for sending your rug to our professional rug cleaning plant! Our Restoration-Cleaning uses a special formulated hand cleaning process (using wet or dry cleaning, as necessary) supervised by our plant manager. This is the finest cleaning available for rugs requiring extraordinary care including silk pieces, thin or worn rugs, or rugs with fugitive dyes. Some stains don’t respond to regular cleaning. Our qualified personnel work on the most stubborn stains with good to excellent results! Emergency cleaning of wet carpet and rugs due to flooding, fire, smoke or other causes. Call us for prompt professional service! At home or office, we schedule on the premises cleaning at your convenience. We first pre-spotdifficult stains. The portable cleaning machines provide a dual method of a steamsoil extraction and a deep lathershampo. We also offer Fiber-Shield® application to protect your wall-to-wall carpeting against spills and soil. treatments. Guaranteed no damage or shrinkage. In-home cleaning of upholstered and leather furniture. We will inspect your furniture to determine the most effective cleaning method and pre-spot any stains. We also offer Fiber-Shield® protection for all fabric and leather furniture. An optional treatment for hand made rugs and carpets, fabric and leather furniture, wall to wall carpet, wall fabrics and draperies. It resists stains, soil and wear by protecting the entire fiber – without changing the color! Our master crafts people expertly reweave holes, “renap” worn areas, restore moth damage, repair seams, reduce a rug’s size, re-wrap and repair a rug’s side, reweave fringes, add artificial fringes, unravel, overcast worn fringes or whatever may be necessary to beautifully restore your fine rugs. Our master craftspeople expertly match every color from our yarns, the ending re-weaved section will have its original look we rebuild every single knot on any kind of design. These cleaning methods are suggestions only. Dilmaghani accepts no responsibility for their use. First, test one of the following solutions on a small, inconspicuous section of your rug. Tackle the stain by working from the outer edge toward the center. Spot check for color fastness prior to wetting your carpet. Apply the solution with a dry cleaning solvent and a white absorbent cloth. One teaspoon of neutral detergent to 1/2 pint of warm water. Add one teaspoon of white vinegar to the Detergent Solution above. One teaspoon of household ammonia to one cup of water. Always work from the outer edge of the spill so that it does not spread. Blot as you work. Alcohol, Coffee, Liquid Foods, Perfume, Tea, Wines, Urine [ urine often doesn’t come out ]! Immediately blot up the spill with a paper towel or cloth. With a spoon, go into the pile and draw out any excess liquid. Then, use the Detergent/Vinegar Solution above. Blot dry. Blot up surplus spillage. Use detergent solution starting at the outer edge. Blot dry. Follow with Ammonia Solution above. Blot dry. Scrape up excess with a spoon. Use dry cleaning solvent followed by Detergent / Vinegar Solution above. Blot dry. Scrape up excess with a spoon. Use detergent solution starting at the outer edge. Blot dry. Follow with Ammonia Solution above. Blot dry. We invite you to use this extensive resource designed to provide detailed assistance for spot and stain removal. 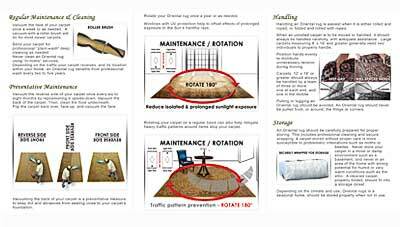 The information contained in our stain removal guide was obtained from reliable sources, however our company cannot accept any responsibility related to the use of our Stain Removal Guide.